10+ Backyard Garden Ideas For Your Home Garden! Is your backyard garden free of space? 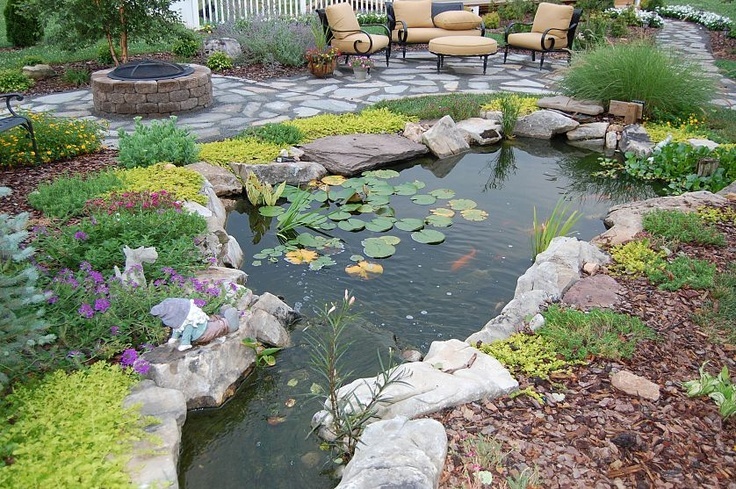 Get the creative backyard garden ideas for making the most out of your outdoor area! Home is defined by both indoor and outdoor area. Most of the people only focus on making the inside of the house beautiful, but you also have to pay attention to your exterior area as well if you want a harmonious design! Let us take your attention to the backyard ideas for your house where you can create something to make it look more beautiful! Also Read: How to Make Your Own Terrace Garden – Step-By-Step Guide! If you have a backyard space, you are lucky enough to have a good space at your house or apartment for a backyard to create your own oasis for your family and friends to enjoy no matter what the season! You don’t need plenty of space for landscape or garden design, we can make it quite elaborate and beautiful! This guide will give you many innovative backyard garden ideas to create your dream backyard garden design, choosen according to your design tastes, spatial limitations, and yes budget! Backyards have become a true expansion of a home. A backyard beautiful landscape is a place where you can get your personal outdoor space to add your needs and desires! When backyards design are well landscaped, it’ll provide an additional outdoor living space where you can spend time with your family and friends too. Nowadays, backyards have become areas for recreation as well as relaxation. Many amenities that used to be just for the indoors in part, such as fireplaces and fully equipped kitchens, are now finding their way out to the backyard design! Here are the few tips that will help to ensure the beautiful backyard gardens. Our backyard garden ideas will have you relaxing in a space that is so equally functional and aesthetically pleasing for your outdoor! To make the most out of your small space, We recommend choosing the items that serve more than one purpose and that will have a big impact without taking up too much of space! For example, a bench (garden furniture) that doubles up as a storage box to store the garden equipments. Be smart to select garden furniture that is easy to move and store, such as collapsible or foldable or portable tables and foldaway chairs, etc. Also Read: 6 Reasons to Use Cane or Rattan Furniture in your House! Serenity situated next to your outdoor seating area when shaded by trees and pond in your backyard make you feel more calm & peaceful! One of the ways to make your space look cohesive is by defining its function! Start by thinking about how you would ideally like to use your outdoor area? Maybe a large dining table is key for outdoor dining, or you would prefer a relaxed seating area with a fire pit. Depending on how much space is available, you can consider sticking with one main function or breaking your garden yard into a few distinct areas! Since it’s unlikely to add more width if you have a small backyard, your only choice for creating the illusion of having more space is to go upwards! Vertical garden in your backyard will encourage the eye to take height into account when viewing and makes you feel more spacious! Small backyards naturally offer fewer opportunities to add the visual interest than the more spacious space allows. Using bold colours is one of the easiest ways to make each one count! For example, just the same as you can bring colour to your interior through the cushions and throw pillows that adorn your seating sets! 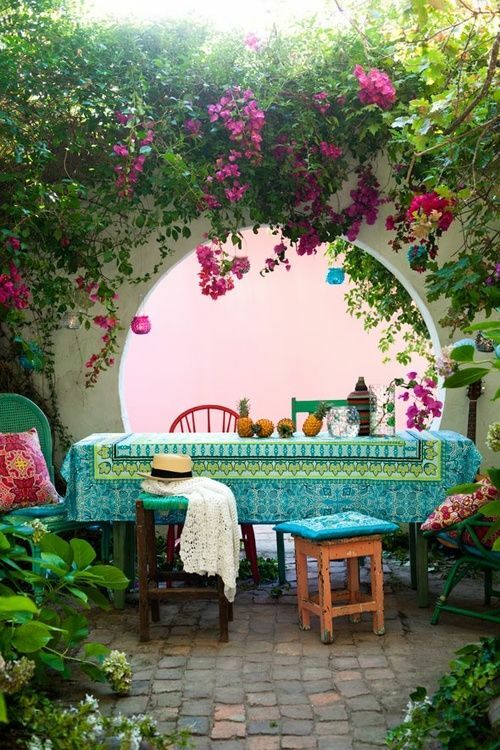 Flowers in bloom are an excellent way to add a strong explosion of colour to any outdoor space! Try to focus on sticking to 2 or 3 colours while planning your entire backyard with the same cohesive colour scheme! 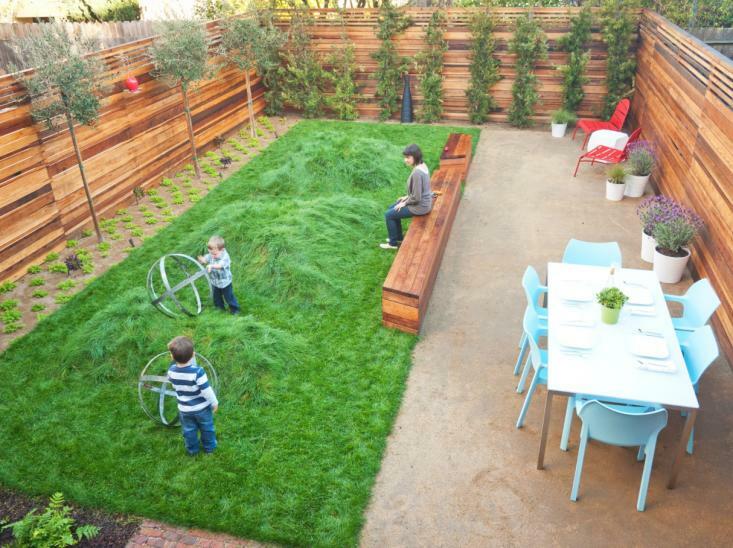 “Less is more” can be very well brainstorming for small backyard garden ideas! Where there is only a small amount of space available, it becomes very easy for the eye to get overwhelmed and your backyard to appear cluttered! Your garden design should be such that the decor items your choose are on minimal! Additionally, also make sure that your lawn stays well-maintained with regular cuttings and proper plant care! 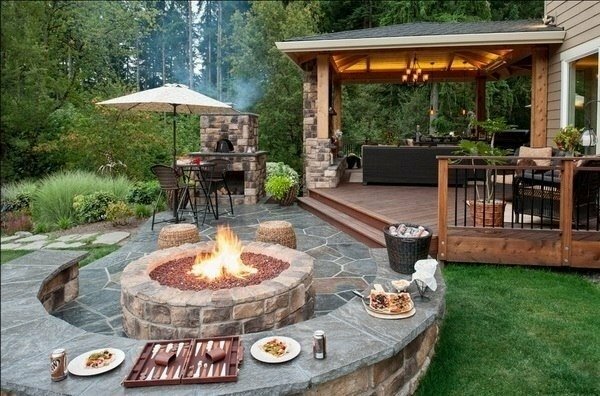 Use a variety of natural materials like pea gravel floor area, garden furniture like wood, stone, brick, etc, fire pit, green lawn, Flowerbed, pond, swimming pool, kids play area, seating area and many more in your backyard by defining the separate zones for entertaining, dining and sitting! 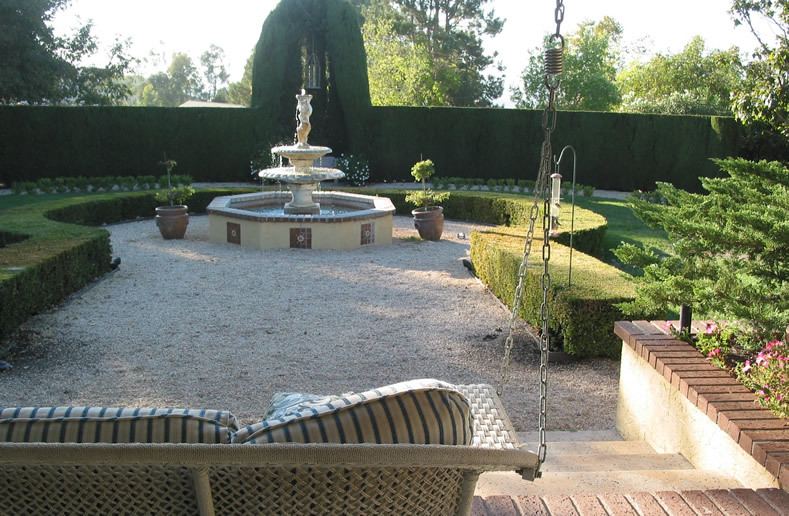 Add a Focal Point: Fountain! You can add a classy fountain as a focal point which can be said as one of the best backyard garden ideas for a large area backyards design! The naturally lush setting was one of the attractions for the most of the homeowners. Plant more trees, bushes and flowers on your property! 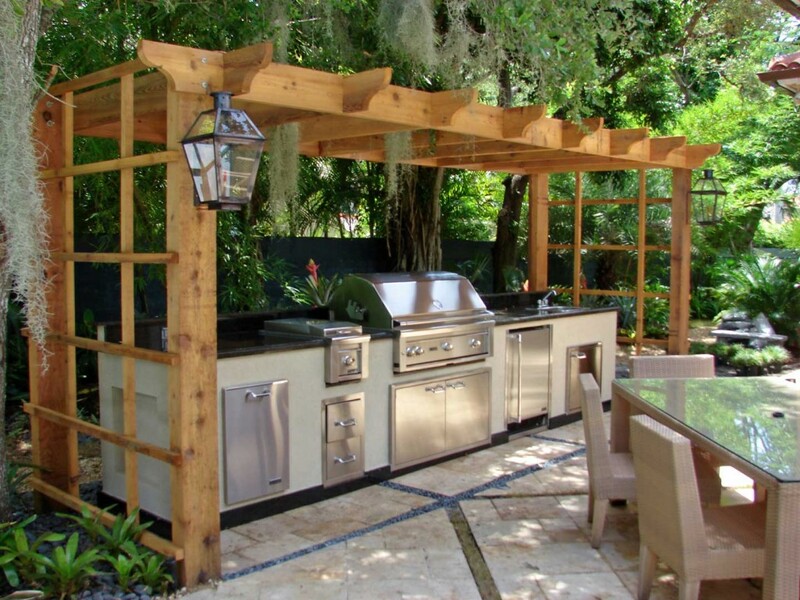 Outdoor kitchen expands your living space and allows you to cook, eat and entertain! Summer is the time for backyard grilling and BBQ’s, but a well designed outdoor kitchen should allow you to enjoy cooking outside beyond the summer months! It is one of the best backyard garden ideas to put into the design. Also Read: Tips to Start Organic Kitchen Garden in Your Home! Architectural elements unite this patio to the home, as do the chandeliers, upholstered furniture and fireplace. Stone, wood and green space keep it tied to nature! The gazebo adds an extra character to your outdoor space. To have a gazebo, you need to have enough big space in your backyard design! A low bridge linking the different parts of the backyard give a transitional space to formal landscaping to a more natural look! Zen garden that uses only rocks and gravel which means “dry landscape”symbolise the space for meditation and contemplation, and the natural elements traditionally used in Zen garden seek to emphasize the quiet power of nature! Hope you are thrilled enough with our best backyard gardens ideas to add a magic to your home garden! Your comments are welcome! 10 Simple Steps to Create an Ideal Meditation Room! 14 Tips for Relaxing Balcony Design of Your House! Next PostNext Ultimate List of Interior Design Styles for your Home Interior!